Gary Mabbutt at The Bury. 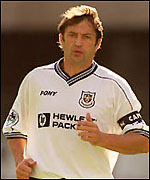 You have a great opportunity to meet Spurs legend Gary Mabbutt at The Bury on Thursday 10th Feb.
Why not come along and meet a player who enjoyed over 600 league apperances for Spurs and Bristol Rovers, 16 England caps and also won UEFA and FA Cup Winners' medals? There will be a question and answer session, photo opportunities and a Tottenham memorabilia auction, along with good company and a flowing bar. Tickets are priced at £15 each and the evening starts at 8:00pm. Contact The Bury (01763 271522) or Barry (07816 618816) for more details. Surely a must for all 'Lilywhites' fans.